“We produce a variety of high quality fruits and nuts that are valued in our local markets, national markets, and in export markets around the world,” says Lindsay Eng, Director of Market Access and Certification for the Oregon Department of Agriculture. More than 225 different agricultural commodities are produced in Oregon. Many of them are fruit crops. 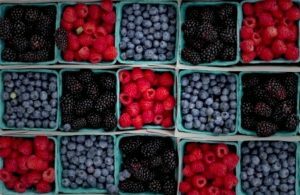 Oregon leads the nation in production of several berry crops. But behind the numbers is the fact that the state’s climate and fertile soils– along with the skill and expertise of the growers– produce a great tasting, high-quality food product that is enjoyed by consumers far and wide. 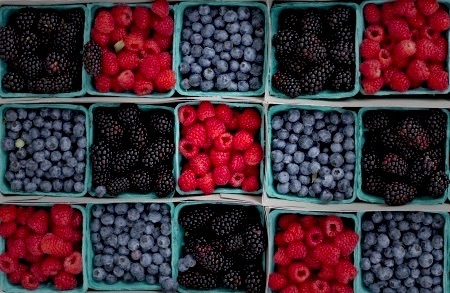 Seasonally, berry crops first herald Oregon’s harvest season, usually in early summer. A cool spring delayed many agricultural crops a couple weeks. Consumers will not have to worry about a lack of Oregon-grown fruits and nuts– they just may need to be a bit patient. Strawberries are available at local markets and stands. Soon to follow will be blueberries, blackberries, raspberries, and sweet cherries. “Get out and start experiencing Oregon fruits right now,” advises Eng. The US Department of Agriculture’s National Agricultural Statistics Service (NASS) has published its non-citrus fruits and nuts summary for the 2016 growing season. A majority of the crops detailed in the report are grown in Oregon and, in fact, some are exclusive to the state. One-hundred percent of the nation’s commercial blackberries and boysenberries come from Oregon. Marionberries, a cultivar of the blackberry, is also 100 percent Oregon. The statistical summary shows there were 7,000 acres planted in commercial blackberries last year in Oregon, producing 58 million pounds with a value of more than $26 million– down 32 percent from 2015’s production value due to a sizable drop in price paid per pound despite more berries grown. Marionberry production last year jumped 30 percent to 29.3 million pounds and is responsible for about half of the total value for blackberries. Oregon also grows virtually all of the nation’s boysenberries despite only having 340 acres harvested last year. Production value fell about 50 percent to $1.3 million. California and Washington lead the nation in raspberry production, but Oregon still keeps its position in third place with 8.5 million pounds valued at $9.2 million. Production was down nearly 10 percent last year. Oregon grows more black raspberries than red and ranks second in that category. One of the most iconic of crops in Oregon is the strawberry. Overall production is a mere fraction of historical highs decades ago, but Oregon’s strawberry industry still ranks fourth in the nation in production. Neighboring California absolutely dominates the nation’s strawberry scene. In Oregon, more than 10.3 million pounds were harvested from 1,100 acres in 2016. By comparison, in 1988, Oregon had 7,800 acres in strawberry production with more than 100 million pounds harvested. Last year, California had 38,500 strawberry acres producing nearly 2.8 billion pounds. Blueberries continue to be a perennial Oregon success story, setting a record high production last year of 116 million pounds valued at $104 million, same as the previous year. Nearly 12,000 acres of Oregon blueberries were harvested in 2016, more than double the acreage of 2009. Washington emerged as the national leader in blueberry production last year with Oregon closely behind in second place. Cranberry production on the southern Oregon coast fell last year to 401,000 barrels and a decreased production value of $10.4 million. Oregon ranks fourth in cranberry production behind Wisconsin, Massachusetts, and New Jersey. Oregon grape production, almost exclusively grown for wine, had a banner 2016 with a production value of $143 million, ranking third behind California and Washington. Tree fruits generally did well last year. Sweet cherries are vulnerable to weather impacts, but 2016 was a rebound year. The 62,000 tons of production was up a whopping 73 percent from 2015. The value of production last year also increased to $79.2 million. Only Washington ranks higher than Oregon in sweet cherry production. Pears continue to be a perennial top ten Oregon agricultural commodity with 14,400 acres in pear orchards producing 215,000 tons last year, down 6 percent from 2015. The production value of $148 million last year reflects a strong price paid for the crop. Only Washington ranks ahead of Oregon nationally in pear production with California ranked third because of its high production of the Bartlett variety– used mainly for canning. Oregon and Washington produce a variety of fresh winter pears. 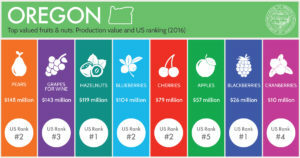 Oregon apple production doesn’t come close to rivaling the Washington giant, but still accounted for 195 million pounds and a value of $57.7 million last year, ranking fifth in the nation. Oregon apples saw an increase last year in both production and value. The NASS survey also captures statistics on nut production. Oregon continues to produce all of the nation’s hazelnuts. Last year’s production of 44,000 tons is up 42 percent from 2015. The production value of nearly $119 million is also a sizable increase– 36 percent– from the previous year. All in all, Oregon agriculture continues to supply consumers from Tualatin to Tokyo with a variety of high quality fruit. 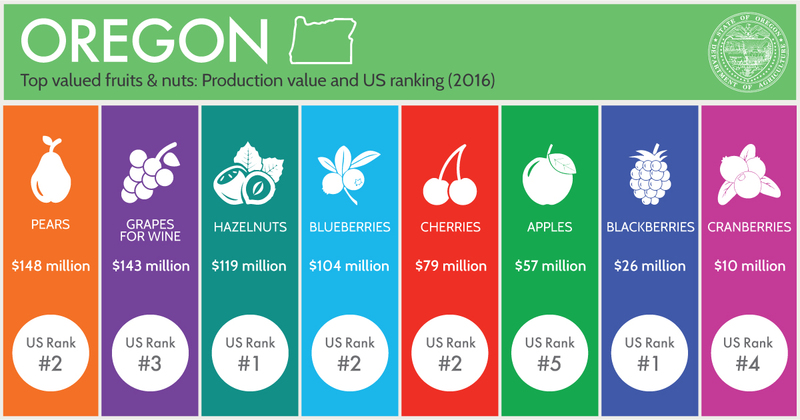 Oregon may not challenge states like California in sheer volume, but it can make the case that the quality of berries, tree fruit, and nuts produced within its borders can’t be beat.